I would like to introduce you to the Instructors and assistants of Chosun Black Belt Academy. I have been teaching the art of Tae Kwon Do since 1994 throughout northern Illinois and southern Wisconsin. I started training in Tae Kwon do as a teenager in order to learn self-defense, as I am not shy to say, I was a huge fan of the old-time “Kung Fu Theater” and similar programs of its likeness. What I quickly found out was that this activity was helping me to feel more confident about myself. My self-esteem was much better, and I started to feel strong as an individual. I continued my training throughout college at Northern Illinois University, which is when I discovered my love for teaching. By the time I had finished college I was in charge of teaching a campus Tae Kwon Do club as well as a University-accredited Tae Kwon Do course. I finished college with a teaching degree in secondary education and immediately began my apprenticeship for instructing Tae Kwon Do. Since that time I have promoted to the rank of 5th Degree Black Belt and have been teaching and managing Tae Kwon Do schools/programs throughout the Northern Illinois (most specifically Rockford) and southern Wisconsin (Beloit, Janesville) areas full-time. Although I recently received my 5th Degree Black Belt (in 2009), becoming a “Master” of Tae Kwon Do, I will always see myself as a “student” of the arts. Mrs. Peterson is a 3rd Degree Black Belt who has been studying TKD since 2000. She originally got into TKD for fitness and found out that it offered a whole lot more. She loves learning the self-defense aspects as it helps her feel more confident in being safe on the streets. She truly enjoys teaching so that she can help others succeed as well. Favorite kick? Her favorite kick is the 360 Back Kick. Accomplishments is TKD? One of her most memorable accomplishments was attending (and surviving) two seminars with Olympic and World Champion, Master Kuk Hyun Jung. Future goals in TKD? Mrs. Peterson would love to continue training so that she can someday become a Master of the art. Hobbies, outside interests? Mrs. Peterson loves spending time with her four children, Kai Young Soon, Duncan, Gia and Cael. She also loves capoeira, gymnastics, photography, scuba diving, swimming, reading, crafts, and spending time with family and did she mention that she loves to spend time with Kai? Any mottos or philosophy of life? Loyalty is the best investment. Advice to beginning students? Keep in mind every high rank was a white belt when they started. It is not easy to stick things out and become a black belt, but if you prioritize your training in your life...it is possible! Mrs. Haberichter is a 3rd Degree Black Belt originally from Milwaukee. She got into TKD in 2004 because her son, Hunter, was in it and she thought it looked like fun. Her husband, Eric and two sons are also in TKD. Mrs. Haberichter is a very dedicated and detailed Instructor. What is your favorite part of studying martial arts? I love getting a great workout, learning practical material such as self-defense, and also being part of a family-oriented school. What is your favorite part of teaching? I love seeing students progressively become more coordinated and have more self-confidence. Favorite kick? 360 Back Kick. Future goals for TKD/martial arts training? My long-term goal is to never stop training in TKD. Misc info: My career interest is in investigating the molecular and cellular biology of von Willebrand disease. My hobbies include fishing, hunting, hiking, running, biking, and reading. Any mottos or philosophy of life? You can achieve anything; set goals and stay on the path. Advice to beginning students? Just keep trying. Since you get to line up in the back of the class, you get the opportunity to watch higher belts, and no one is watching you. Everyone in the class was a white belt at one time. Mr. Haberichter is a 1st Degree Black Belt from Greenfield who has been studying TKD since 2004. His wife, Sandy and two sons are also in TKD. Mr. Haberichter is a very animated, fun Instructor. Why did you start in TKD? I had an interest since childhood. I was a Bruce Lee and Chuck Norris fan, and also had friends that did Karate and Judo. I thought it would be good exercise and that it would be structured, something I'd stick with. What is your favorite part of studying martial arts? I really enjoy the exercise and challenge. I enjoy self defense, sparring and bunkai. Besides the physical aspect of training I enjoy being a student. When I am in TKD class I can allow myself to relax by giving in to the structure of the class. I am totally focused in training and everything else disappears; for me it's the most relaxing thing I do. What is your favorite part of teaching? I have two favorites. First, I enjoy working with the kids because they always remind me of just how much I don't know, and second, I enjoy teaching/learning with the other adults. I definitely learn a great deal while teaching. I especially enjoy teaching self defense and working one on one with other students. Favorite kick? Jump Spin Crescent. Best accomplishment in TKD so far? Dedicated training for four and 1/2 years, I believe that staying with it is the real key to success. Future goals for TKD/martial arts training? Mid term- improve flexibility, cardio-training, sparring. Long term- 2nd Degree Black Belt. Misc info: I enjoy outdoor activities with my family. We camp, hike, swim, fish and hunt. I especially enjoy archery. I consider myself a "lucky Wisconsinite" because I enjoy being outside almost every day of the year. I own/run Smart Choice MRI. I am absolutely dedicated to lowering healthcare costs. Any mottos or philosophy of life? You make your own future, make it a good one. Advice to beginning students? Stick with it. You owe it to yourself to work hard and get past a few challenges. People who accomplish great things in martial arts and in life had to do things that were hard; only by challenging yourself can you reach your full potential. Mr. Sellers is a 2nd Degree Black Belt originally from Franklin. Pete's son, Gabriel is a student as well! What is your favorite part of studying martial arts? Discovering how to better coordinate the body and the mind as a martial artist. It's a fantastic experience and one that changes who you are on a number of levels. What is your favorite part of teaching? Being able to impart my knowledge with my students and watching them grow! Best accomplishment in TKD so far? Winning the "Grand Champion" trophy for form at the Tri-State tournament in 2008. Future goals for TKD/martial arts training? My long term goal is to continue to grow and eventually become a black belt, though my short term goal is to gain a few more "Grand Champion" trophies...! Misc info: I enjoy playing tennis, biking, video games, reading, watching movies, hanging out with my family, singing, and cooking. Any mottos or philosophy of life? Life is a challenge with many obstacles and fears to face - we must always be ready to rise to the occasion and continue to grow, even if it means having to face the challenges head on! Advice to beginning students? Believe in yourself, but don't become frustrated if you're having trouble. The most difficult path is the most worthwhile and things we find frustrating today, will more than likely be easier tomorrow. 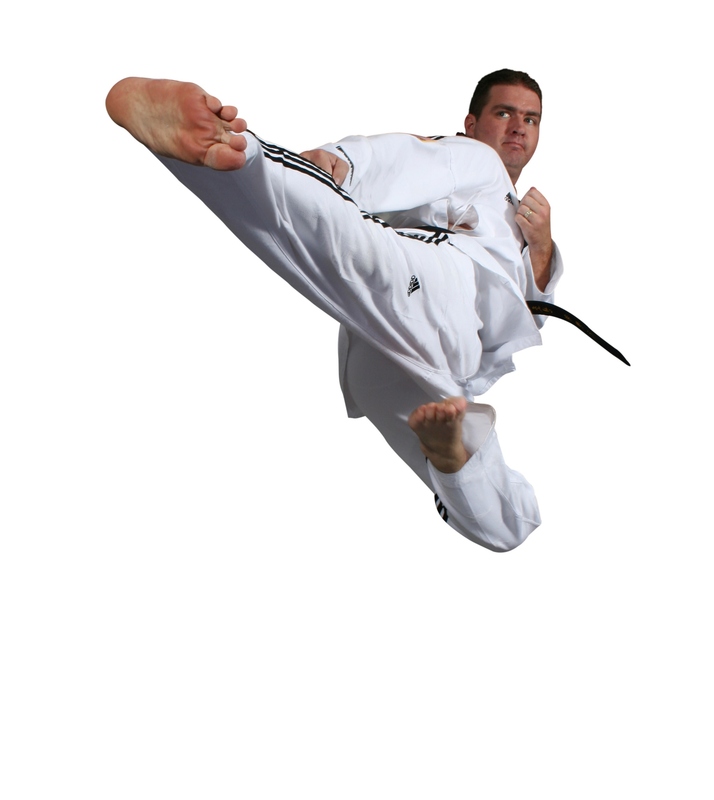 Mr. Oulahan is a 1st Degree Black Belt and has been training at Chosun since 2007. Why did you start TKD? I wanted to be like my hero, Jet Li. What is your favorite part of studying the martial arts? I think it was the free cookies. What is your favorite part of teaching? The joy I impart on my students through vigorous workouts. Favorite Kick? 720 triple jump spin kick. Best accomplishment in TKD so far? I love it all. Future goals for TKD/martial arts training? Becoming a ninja warrior. Motto/philosophy of life? Don't take any wooden nickels. Advice to beginning students? Don't talk in class. It worked for me! Mrs. Van Ert is a 2nd Degree Black Belt originally from Brown Deer who has been in Tae Kwon Do since 2008. Why did you start TKD? Master Peterson made the annual "family offer". It looked like fun and I decided to try it out for just a month. What is your favorite part of studying the martial arts? The positive energy you feel from everyone. At first I was intimidated but everyone was encouraging and put me at ease. What is your favorite part of teaching? Watching the joy on the children's faces as they execute a new technique. Best accomplishment in TKD so far? Surviving my first testing and tournament. I became much more relaxed after that. Future goals for TKD/martial arts training? To keep training and learning. Misc info: My husband Dan and I have 3 children; Amanda, Abby and David. They keep us busy with their sports schedules and it's fun watching them grow day by day. When we do have some down time we love to hang out together . We also love to spend time outside by the fire with our friends. Motto/philosophy of life? The explanation of triumph is in the first syllable. Advice to beginning students? First, welcome, it's going to be fun! But, don't give up, everyone here was a white belt at the start. Mrs. Osterberg is a 2nd degree Black Belt who has been in Tae Kwon Do since 2009 and her son Jacob is also is Tae Kwon Do. She is originally from Baraboo, Wisconsin. Why did you start TKD? It is something that I've always wanted to do. I also joined to gain self-confidence and exercise. What is your favorite part of studying the martial arts? Surprising myself by what I can accomplish! I also love the gymnastic component of Martial Arts. What is your favorite part of teaching? I love to watch the look on the students' faces when they learn something new. Best accomplishment in TKD so far? Successfully competing in the Chosun Hanmadang Tournament. Misc info: I enjoy running, yoga and spending time with my two children. Motto/philosophy of life? Stay positive, don't sweat the small stuff. Advice to beginning students? Stick with it! Don't look too far ahead, keep your mind focused on where you are. Mr. Staerkel is a 2nd degree Black Belt who has been in Tae Kwon Do since 2009. He is originally from Oshkosh, WI. What is your favorite part of teaching? Helping the students. Best accomplishment in TKD so far? 1st in Family Form at 2 Tournaments with my son. Future goals for TKD/martial arts training? Black Belt, never stop learning. Motto/philosophy of life? Always have a positive attitude. Advice to beginning students? Stick with it!! Mrs. Beaudot is a 2nd degree Black Belt from Milwaukee who has been in Tae Kwon Do since 2010. Why did you start TKD? My daughters are both students and I thought it would be fun to learn what they were learning. What is your favorite part of studying martial arts? Allowing myself to become singularly focused, mind and body, on the lesson that is being taught. What is your favorite part of teaching? Watching the joy on the students faces as they learn and then master new techniques. Best accomplishment so far in TKD? Learning to glance at the horizon to get my bearings, but to keep my focus in the moment. Future goals for martial arts training? To still be learning and practicing when I am very, very old. Misc. interests? I like learning new languages, reading, excercizing, baking and making greeting cards. Any mottos or philosophies? Team work makes the dream work. Any advice for beginning students? Ask for help when you need it. Our school is full of people willing to spend time sharing their knowledge and ability. Carrie is a 1st degree black belt from Warrensburg, Missouri who has been in Tae Kwon Do since 2011. Why did you start TKD? I had started as a young girl after my father returned from a TDY assignment with the Air Force in Korea. While in Korea, my father earned a black belt in Tae Kwon Do, I was very interested in TKD and joined a school, but was not able to pursue further training beyond an orange belt. When my son and I had difficulty relating to each other I became determined to find an activity that we both could pursue and hopefully gain some common understanding. What is your favorite part of studying martial arts? The challenges. What is your favorite part of teaching? Every time I learn about others and myself. Best accomplishment in TKD so far? Earning the Best Sparring award twice. Another major factor in pulling me from TKD when I was a child was the fact that I could not spar. Misc? I have a B.S. in Early Childhood Education from Alverno College. I am licenced by the state of Wisconsin to teach children up to the age of 11. I am an artist and writer. I also love animals, reading and outdoor activities. Advice to beginning students? Build a strong foundation. Before you take the next step in your journey, make sure your know and understand the materials and techniques. Be aware of any weaknesses, make a plan and set goals to become stronger with each belt level. Do more than "just enough" when it comes to practicing and studying. Above all, never give out, never give in and never-ever give up. If you do you will underestimate yourself. Mrs. Beaudot is a 1st degree Black Belt from Milwaukee who has been in Tae Kwon Do since 2011.